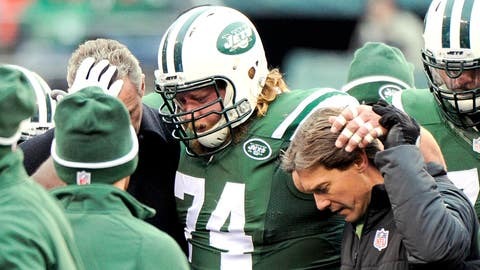 Nick Mangold left Sunday's game with a neck injury and was unable to return. In addition to losing to the New England Patriots on Sunday, the New York Jets may have lost a key player along their stout offensive line. Nick Mangold left the game in the fourth quarter during the Jets' last-ditch effort to mount a comeback due to a neck injury and was unable to return. The severity of the injury is not yet known, but head coach Todd Bowles said Mangold will have X-rays taken on his neck. The injury occurred as Mangold was attempting to block for Ryan Fitzpatrick on a completion to Brandon Marshall late in the fourth. Mangold remained face down on the field for some time before rolling over and eventually making his way to his feet. He was then carted off to the locker room. After the game, Mangold was spotted wearing a neck brace as he was leaving the locker room. He's been the model of consistency as he's missed just three games in his 10-year career.